LOS ANGELES (CelebrityAccess MediaWire) — KB Home, a developer that had partnered with AEG in the construction of a 54 story hotel, has sold its interests in the project to AEG. The hotel had been part of the 27-acre, $750 Million entertainment complex, known as L.A. Live, which is under development in Los Angeles near the Staples Center. Construction is slated for completion in 2010. KB Home, a development firm started by Billionaire Eli Broad, withdrew from the project, citing slowing housing markets. "KB has not been immune to the changing dynamics in the housing market," Caroline Shaw of KB Home told the LA Times, "We really think this project will be a great project and we are very supportive, but building high-rise towers is not part of our corporate business model." The city has been working on developing a hotel to service the convention center for some time and KB Home's withdrawal from the project doesn't seem as if it will disrupt those plans. 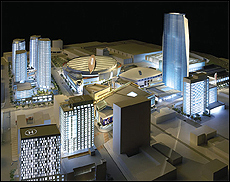 The planned complex will include live music venue, the Nokia Theatre – Los Angeles, movie theaters, shopping, the aforementioned hotel, a state-of-the-art broadcast facility for ESPN and a spacious outdoor plaza.